Desert Nights Casino was established in 2010, and is licensed by the Curacao e-Gaming Licensing Authority in the Netherlands Antilles. This license provides assurance the casino is actively operating in compliance with strict industry standards, according to a strict code of conduct as required from having a gaming license from the government of Netherlands Antilles. This casino brings you a complete gambling oasis for fun and excitement right into the comfortable and relaxing atmosphere of your home… in beautiful hues of the Sahara in purple and gold. Their online gaming content is delivered to you with Rival Gaming Software and there are more than 200 games you can choose from. There are Classic 3 Reel Slot Games, Video Slot Games, i-Slot Games, Progressive Games, Video Poker Games, and Table Games like Blackjack and Roulette. The download version delivers the full gaming suite… the free software is provided for you to install directly on the hard drive of your Windows PC. The instant play casino is browser-based, and it is seamlessly integrated into the website. You play the games in a window of any internet browser… no download or installation is required. 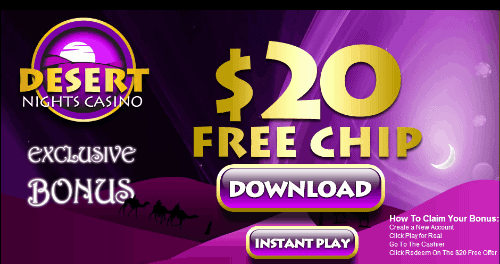 Take your favorite Rival Games on-the-go with Desert Nights Mobile Casino! There are 42 great games available… play them with the touch of your fingers from your preferred mobile or tablet device… it’s quick, fun, and easy-to-use. Supported devices are Apple iOS – iPad Air, 4th Generation iPad, 3rd Generation iPad, iPad 2, iPad mini Retina display, iPad mini, iPhone 6, iPhone 6+, iPhone 5S, iPhone 5, iPhone 4S, iPhone 4, 5th Generation iPod touch, and all Android 4.0+ tablets and phones with a minimum of Chrome 31.0 browser. A wide range of other devices, including the latest Blackberry devices, will also run the mobile games. Your personal information and transaction data remains private, and the casino goes to great lengths to keep your information 100% safe and secure. Transactions are securely handled and processed using SSL 128-bit encryption for confidentiality at all times. These procedures are designed to ensure the integrity of all electronic transactions, purchases, and withdrawals made within their system. Please read the terms and conditions on the ‘Promotions’ page of the casino website to understand all your wagering requirements for the bonuses. Enjoy the Ultimate Desert Oasis Adventure and Play at Desert Nights Casino.